Cowick is a Saxon name derived from the manor of Cowic or Coic, which was on the west side of the river from Exeter. Wick is the Saxon word for farm, so it is literally 'cow farm'. Cowick Street is very straight between the railway bridge and Old Vicarage Road, suggesting that it may have been laid out by the Romans. This is also the limit of the frequent flooding that has occurred over the millennia. 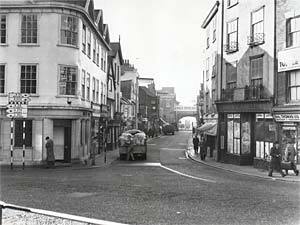 Cowick Street was an important gateway into Exeter from the west, and, as such, was highly prized by both sides during the Civil War. During the second siege of Exeter in 1643, St Thomas was held by the Royalists, as Parliamentary Exeter was under siege. On the 4th September, the defenders surrendered the city to the King's forces. Beaufort House, which had been, for a few years, the County Bridewell, was fortified, along with other houses around St Thomas and Exwick. By early 1646, under pressure from Parliamentary besiegers, the Royalist defenders of the city, set fire to St Thomas Church, collapsing the tower, and fell back into the Bridewell. Parliament took St Thomas, apart from the Bridewell, which was only handed over to Fairfax's forces after the surrender was signed at Poltimore House in April 1646. 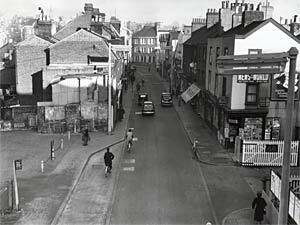 The damage to St Thomas and Cowick Street was extensive, and the years following the war were spent rebuilding the many shops and houses that had been demolished to give a clear field of view for hostilities. Many of these buildings would remain until the great clearance and rebuilding during the 1960s and 70s. "The Exeter, the metropolitan match, is looked forward to with great interest, commencing on Monday the 28th instant; this match it is understood will be attended by players and visitors from every part of the County of Devon..." Prizes to the value of 30 sovereigns were offered, with 10 sovereigns for the best man. On the opposite side of Cowick Street behind the Sheriff's Ward, or Debtor's Prison, on what is now Clinton Street, Rugby Road and Buller Road, was another field in which a contest was held between a man and a horse in October 1850. A two mile race over 50 hurdles for a wager of £50 was run, in front of a large crowd. The horse, a mare, easily beat the man. St Thomas suffered to a lesser extent from the cholera outbreak, in 1832, than the parishes on the other side of the river. Cowick Street had 20 fatalities, with another six from courts off the main thoroughfare, between July and October. Some of the victims would have been infected while visiting the city, St Thomas was not so crowded as the Westquarter, and there was no single major source for the bacteria in St Thomas itself. On the 30 May 1846, the South Devon Railway ran its first train to Teignmouth from St Thomas Station, on the line built on the top of the viaduct that had crossed St Thomas, thus bisecting Cowick Street. Although Brunel's brave experiment with the atmospheric propulsion system proved to be a failure the line, using conventional engines, proved to be a success. In 1848, it was calculated that 90% of the passengers on the up line, alighted at St Thomas, rather than St Davids. Suddenly, the station became an asset for any person owning a house within a short walk of the station, and the advantage was promoted when the property was put up for sale. The station had been built over the site of a drinking house called The Pit. James Cossins wrote in 1877 "No doubt many readers are not aware of the situation of the then Pit it was the site of the present railway station, and was about four feet below the roadway consisting of an inn, blacksmith's shop, and a dwelling house, almost adjoining Beaufort House, which was originally the County Gaol." Many of the houses of Cowick Street were thatched until quite late in the 19th-Century, increasing the likelihood of a devastating fire. Possibly the worst fire reported occurred in July 1840 when a linhay belonging to Mr Snow caught ablaze - within ten minutes the roof was destroyed, before the flames spread to the adjoining house where Mr Snow's elderly, and ill father was living. Neighbours rushed in and managed to rescue the old man, with some difficulty, and at the same time, save the house. However, the linhay had a thatched roof, and blazing thatch was blown across the road and set fire to the thatched roof of a house, close to the church, belonging to Mr Vicary. The house was gutted, leaving just the four walls standing. Engines from the fire insurance companies and from the barracks, were quickly on the scene, but were unable to save either building. That thatch was proving to be a fire hazard in an urban setting, did not prevent some from continuing to use the material. In August 1864, Miss Copp re thatched several of her cottages, in Cowick Street, against local regulations, and the St Thomas Local Board ordered her to take it down and replace it with less flammable material. Some events, although devastating at the time, elicit a wry smile now. One Saturday, at midnight, in May 1849, a "terrific explosion" occurred in a row of houses opposite the Sheriff's Ward. The centre of the explosion was the water closet belonging to the house of Miss Scanes and Mrs Lane - their house was blown apart, while destroying 40 panes of glass in the property adjoining, belonging to Mr Manley. The day before, workmen had been working on a drain in Cowick Street, outside the house, and it is thought that gas from a pipe that was accidentally cut, leaked into the drains and into the water closet, before it unfortunately ignited. One can't help wondering whether either the ladies was a smoker. The middle of the 19th-Century was an uncertain time, with rising corn prices due to a series of bad harvests pushing up the price of bread. In January 1854, riots in Exeter broke out, when initially women and children, and later the men, broke into bakers and millers across the city, smashing up premises and stealing bread. A mob in Cowick Street attacked the bakers shop of Mr Dimond, shattering the door and smashing every pane of glass. They broke a mirror and a clock before stealing his stock of bread. Other bakery shops were attacked; Mr Kay's house was damaged, Mr Norris' had 42 windows broken and bread stolen and Mr Will's lost bread and suffered damage. A troop of cavalry were called, but by the time they arrived, the mob had fled past the Dunsford turnpike gate towards Alphington. This was not an isolated incident, and riots occurred in other years, including August 1872, when Mr Dimond's, Mr Norris' and Mr Kay's shops were again attacked and ransacked. Occasional acts of minor vandalism would occur, just as they did, in many other streets. In 1876 "Henry Woolway, a boy eight years of age, was summoned for throwing stones in Cowick-street, St. Thomas, on the 10th instant. For some time the inhabitants of Cowick-street have been nightly annoyed by boys throwing stones at the doors, and ringing the door bells; the defendant is the first offender to be caught, and he was fined in the costs, 7s 6d." Later, events in another part of Exeter affected one citizen of the street when twenty year old Eliza Thorn was the only casualty, out of 188 dead, from the Theatre Royal fire of 5 September 1887. The other very real hazard of living in Cowick Street was the regular occurrence of flooding. In January 1866, flood water that reached the height of a cart axle, spread across Cowick Street, Alphington Street and Okehampton Street. An article in the same year, listed 25 years when flooding hit Exeter between 1800 and 1866. In 1810, the water rose 13 ft 3 inches (4.16 metres) above normal summer level, and in 1829 there was flooding on four occasions. The storms in 1809 were so fierce that "A great number of elm trees, which formed the avenue at Cowick, were blown down." The water that the inhabitants of Cowick Street really needed, was a clean, wholesome supply for drinking and washing. The St Thomas Local Board decided in July 1872, that at last, a water main should be installed in Cowick Street, although the first two tenders, from Mr Ford and Mr Kerslake were rejected, as too expensive. The next year houses in what were known as the Cowick Street Estate were having mains installed. The fields behind the shops and houses of the street were gradually being built upon. By 1893, most of the housing between Cowick Street and Alphington Street was complete and the Local Board considered opening up access to the rear of the street; in the event, Cecil Road is the only access to the area, although there had been plans to make a link between Union Street and Cowick Street. Improvements were gradually made through the 19th-Century and the St Thomas Pleasure Ground was opened in 1891 as an amenity designed to improve the environment and health of the locals. The St Thomas Local Board were based in their own, purpose built offices in Cowick Street, almost opposite the church. They started their own fire brigade in July 1889, and opened a purpose built fire station in, next to the Local Board office, in 1898. However, both closed within two years, when St Thomas was incorporated into Exeter in 1899. In the 1960s it was a metal workshop owned by Roy Woodward. Now the building is used by Age Concern as a centre for pensioners to drop in for a chat or meal. 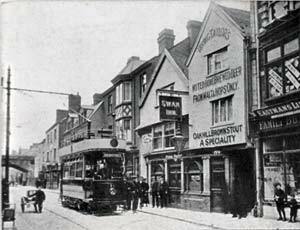 The coming of the electric tram changed the nature of Cowick Street. From 1905, trams regularly journeyed as far as the Falmouth Inn, below Dunsford Hill, where the pick-up was swung around by the driver, using a long pole, and re-attached to the overhead wire. The tram then returned back down Cowick Street with a clang, clang noise alongside the sound of the electric motor. There were no fatal air-raids on Cowick Street during the Second World War, although there were several killed in 1942 when four bombs were dropped on Okehampton Street, damaging the rear of some of the shops at that end of Cowick Street. 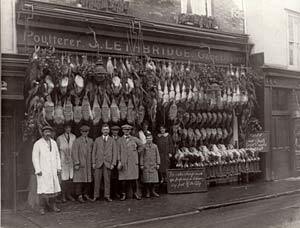 One, Lethbridge's the butchers, had an egg packing plant at the rear - the blast from one of the bombs badly damaged the plant, and a huge yellow omelette oozed out from under the double doors at the front, as thousands of eggs disintegrated in the shock wave. The County Ground was taken over by the military, mostly for army transport, and American forces preparing for D-Day. There were many black American troops in St Thomas, camping at the County Ground, as there was a US policy of segregation at that time, and they were not allowed over the Exe Bridge into the city. 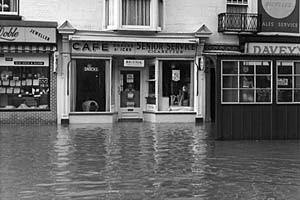 The flooding of 1960 spread right across St Thomas, and Cowick Street saw small boats rowing up and down, rescuing people trapped in the shops and houses on each side of the roadway. Plans for replacing the Exe Bridge, as part of a scheme to improve flood prevention and traffic flow were drawn up after the floods. The first work commenced, when a roundabout was created at the junction of Cowick Street, Okehampton Street, Exe Bridge and Alphington Street. The shops on the northern side of Cowick Street, between Okehampton Street and Kings, the public house, were demolished and rebuilt on a new line to widen the roadway. 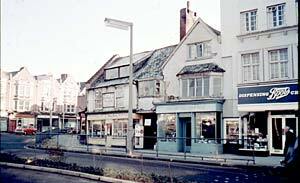 The opposite side of Cowick Street between the roundabout and St Thomas Station were demolished in 1970, to be replaced by the library and Sainsburys in the 1980s. On the opposite side of the railway, between the bridge and Buller Road, pubs and shops dating back to just after the civil war including the Moreton Inn and Turks Head were demolished for a car park in 1970, and the St Thomas Shopping Centre. In September 1974, the street was featured in a Monty Python sketch, when two tramps find a bottle of champagne in a rubbish bin. The modern Cowick Street contains some interesting old buildings along its length, including the façade of the former Devon County Debtors Prison, the old Fire Station and Council Offices, St Thomas Church (with a monument to Grace Darling) and a variety of interesting old shops. Sources: Trewman's Exeter Flying Post, James Cossins, and Two Thousand Years in Exeter. 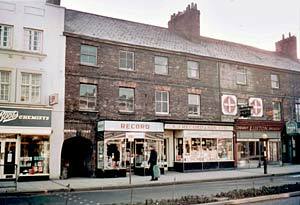 Cowick Street and Alphington Street joined at this corner - late 1960s when the corner had been demolished. Photo Alan Mazonowicz. South side of Cowick Street - behind was Brown's Court - late 1960s. Photo Alan Mazonowicz. The Swan Inn, Cowick Street, looking west. The view down Cowick Street towards the railway bridge. Alphington Street left and Okehampton Street is right - 1950s. Photo Express and Echo. Cowick Street from the railway bridge. looking towards Exe Bridge. Photo Express and Echo. Lethbridge the poulterers. Photo Tony Lethbridge.